We here at O Taste and See Blog like to live on the edge…..
We eat raw cookie dough and we’re not afraid to admit it! Yes, we lick the spoon, beaters and bowl when we bake. Almost as much cookie dough is eaten raw as baked. Someone in our family (who shall remain nameless) has actually asked for AND received a whole TUB of cookie dough for Christmas….for the sole purpose of eating it before cooking! That same Someone has also made it her goal in life to be able to determine the greatness of a chocolate chip cookie just by tasting the dough. Often when cookies are being made, someone will sneak a few spoonfuls of dough into a plastic container and hide it in the fridge to be enjoyed later. Yes, we eat raw cookie dough! This recipe isn’t really “cookie dough” but it does taste quite similar. We first had it at a reception where all the snacks were dips. It’s a wonderful addition to any party and can be served as a snack or dessert. A few ingredients and a little bit of time is all you need. 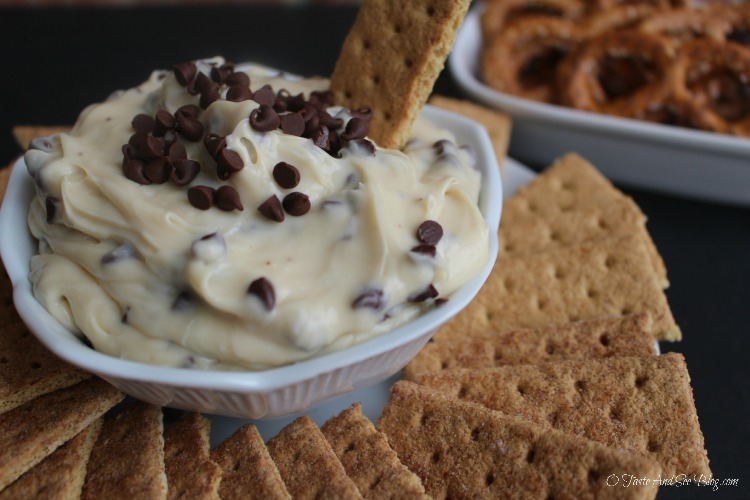 Serve with graham cracker, pretzels, apple slices or vanilla wafers. I love this dip! It is so yummy. I think I can skip the dipping foods and go straight for a spoon! I may or may not have done that with this batch!